This section of the Aggregate Designs Corporation web site is intended to inform the reader about different aspects of cone crushers. They are sometimes called gyratory cone crushers. Cone crushers crush rock between two conical surfaces called the mantle (lower movable surface) and the concave liners above. These surfaces do the actual crushing and are constructed of high manganese steel. Cone crushers can be used in a primary crushing role but are typically seen more often in a secondary or tertiary position. There are two types of cone crushers with respect to the pay product size: stand head and fine head cone crushers. Fine head cone crushers have a reduced-size opening and so can't take as large of feed material but can produce a finer output product. Crushing action is achieved by the eccentric movement of the lower portion of the main shaft. The mantle is connected to this main shaft. The gyrating action of the main shaft causes the gaps between the mantle and liners to change dimension and perform the actual crushing. 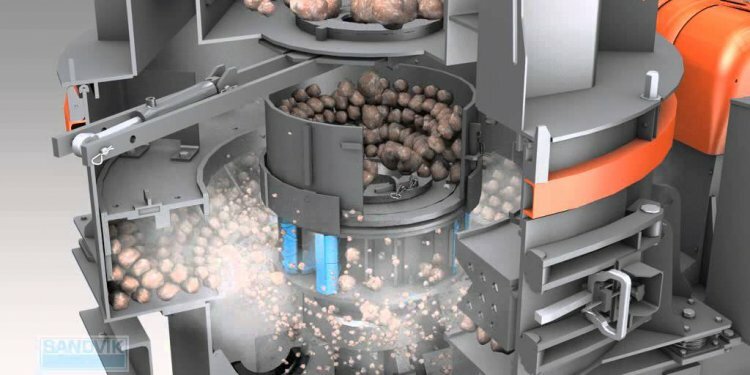 The mantle is one of the actual crushing surfaces in the cone crusher It is the one that moves in a rotary pattern driven by the counter shaft to crush rock between itself and the immobile liners. The mantle doesn't actually rotate; rather it moves in a circular pattern due to an eccentric lobe on the main shaft. The concave cone liners are the other surface that does actual crushing. The liner is shaped like an inverted cone (big side down) with the upper side have an opening that will accept the material to be crushed. These are also made of durable manganese for long life.